Plants for sale are "Summer Sunset" blueberry plants. Plants are between 6"- 16" tall "They grow fast!!". 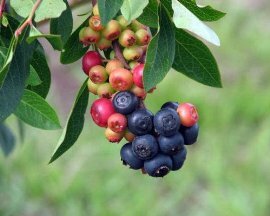 Summer Sunset is a new Var of blueberry hybrid that boasts Pink, Blue, yellow, purple, orange, red and green fruit all on one plant. The blueberries are ready to eat when they reach a dark, almost black color. 'Summer Sunset' has gorgeous non-glaucous foliage, that shines. This one is sure to become a favorite. Pink Lemonade Blueberry is an excellent pollinator for Summer Sunset and vice-versa.